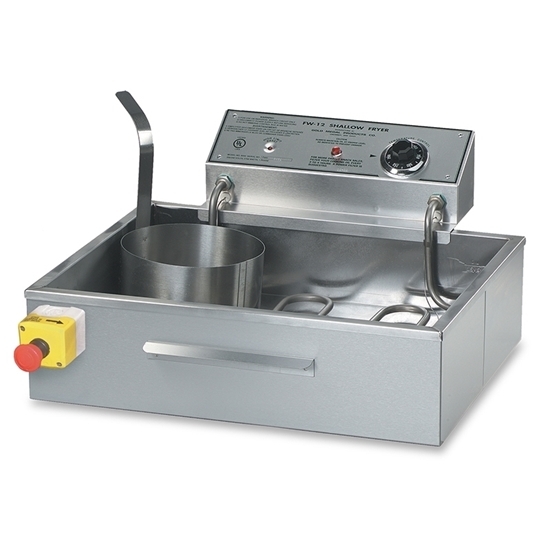 The FW-12 is a versatile, tubular element fryer with a drain. This dependable and classic machine is capable of cooking four 8" funnel cakes, two large elephant ears or 12 French waffles to crispy-crunchy perfection. At 5,500 watts, this fryer holds 27 lb. of cooking oil and comes standard with a safety plug and drain. Donut screen is not included. Four Funnel Cake capacity. Cooking area 21" x 15.5"